Can Ambati Rayudu save his place in the squad? India's World Cup preparations suffered a major blow after the team was stunned by Australia, minus Steve Smith and David Warner, in what was India's last ODI series before the World Cup. India was expected to make light work of the Aussies and try out different combinations before the ICC Cricket World Cup 2019. However, things did not go the way the Indian team management would have liked and performances of some players have left some questions unanswered. 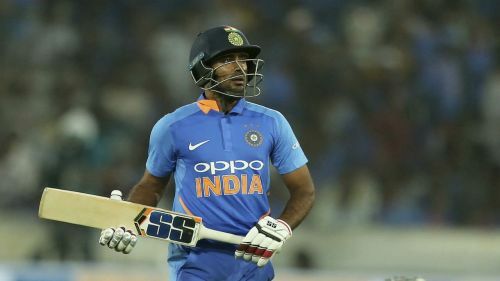 Hardik Pandya's unavailability provided chances to the likes of Vijay Shankar and Ravindra Jadeja to secure a place in the final 15. While Shankar impressed with the bat and Jadeja was brilliant in the field and with the ball, none of them did justice to their 'all-rounder' tag. Also, India's middle-order problems escalated during the series. Even though the deadline for announcing the final squad is more than a month away, some of the players from the squad against Australia might be feeling the heat. Here are 3 players from the team against Australia who might not make it to the World Cup. KL Rahul's World Cup dreams were given a lifeline when he was selected in the ODI and T20 squads against Australia. While he performed well in both the matches in the T20 series, Rahul got just one opportunity in the ODI series. In the 4th match played at Mohali, Rahul, who was batting at number 3, scored 26 runs off 31 balls on a belter of a pitch. Rahul's ODI form has been patchy in the recent past and he currently looks like a man who is short of confidence. It will be a tricky situation for the selectors as Rahul hasn't looked comfortable in the middle-order and with Dhawan and Rohit at the top, he is unlikely to find a place in the side as an opener.